As we start the process of looking toward next fantasy football season, let’s take a look at a top IDP storyline heading into the 2019 action. Let’s keep this introduction short and sweet: This is a look at why Leighton Vander Esch will be the top-scoring IDP player in the 2019 season. The 2018 season was very productive from a fantasy standpoint for rookie linebackers. Four rookies finished in the top-12 in balanced scoring, an impressive total. By comparison there were no rookie linebackers in the top-12 in 2017 and just one in 2016. Colts rookie linebacker Darius Leonard was the overall top IDP scorer last season, posting 161 total tackles along with 15 splash plays. He was joined in the top-12 linebacker scoring by fellow rookies Vander Esch, Tremaine Edmunds, and Roquan Smith. The easy path would be to say Leonard will dominate the position again in 2019 as the man in the middle for the Colts, but a closer look reveals why I believe Vander Esch is poised to rise to the head of the linebacker class next season. Vander Esch managed to put up top-five linebacker totals in a season he basically began as a backup to Sean Lee. The rookie did not see more than 33 snaps in a game over the first three weeks of the 2018 season. Amazingly, Vander Esch managed to post double-digit total tackles in Week 3 while playing just 33 snaps. The veteran Lee would suffer a hamstring injury that would cost him nine games, leading to an expanded role for Vander Esch, and he certainly took advantage. Vander Esch finished the regular season with 143 total tackles and a pair of interceptions. Vander Esch managed double-digit solo tackles in three games last year as well as double-digit total tackles six times. He graded out as a top-five overall linebacker in PFF grading and in the top-three in run-stop percentage. It’s worth noting that Vander Esch finished with just 18 fewer total tackles than Leonard while playing 172 fewer regular-season snaps. The speedy Vander Esch has sideline-to-sideline speed with a nose for the football and should see an uptick in snaps in 2019. Even if Lee decides to return for the 2019 season, it’s likely he would be relegated to a backup/mentor role behind Vander Esch and Jaylon Smith. More playing time will certainly lead to more splash plays for Vander Esch as the two he posted last season will have to improve. The Cowboys only brought Vander Esch on the pass rush on 17 of the 784 regular-season defensive snaps he played. By comparison, Smith was brought on the rush 89 times and Lee was brought 17 times on just 222 snaps. Vander Esch was credited with four total quarterback hurries last season but failed to register a sack. Another reason to believe Vander Esch has surpassed Lee on the depth chart is that in the two Dallas playoff games last year he played 109 snaps (putting up 14 total tackles) and Lee played just 25. Injuries have plagued Lee throughout his career as he has never played 16 games in a season and his play has slowed in recent years due to myriad injuries. The torch is being passed to Vander Esch and he has the tool set to ascend to the top of the linebacker position for fantasy purposes. 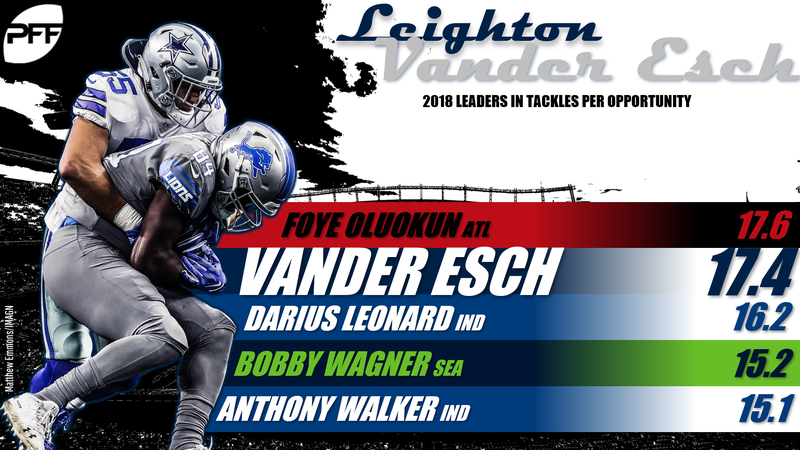 The lack of splash-play production last season kept Vander Esch from challenging Leonard for the top spot, but there are reasons to believe those numbers will improve. As mentioned earlier, an uptick in playing time will serve Vander Esch well, as will his nose for the football. He was credited with 54 regular-season stops, leading led the team. A look at his final season at Boise State, which was also the only season Vander Esch was a full-time player, reveals splash-play potential. In his final college season, Vander Esch finished with 141 total (91 solo) tackles along with 8.5 tackles for a loss. More importantly, Vander Esch posted four sacks, two interceptions, and four forced fumbles in 14 games for Boise State in 2017. It’s also important to keep in mind that the 15 splash plays Leonard amassed last season is more of an outlier total than the norm. It’s unlikely Leonard, or any linebacker, will be able to match that total in 2019. In the past four seasons the top-scoring linebacker has not put up more than 10 splash plays in the regular season. 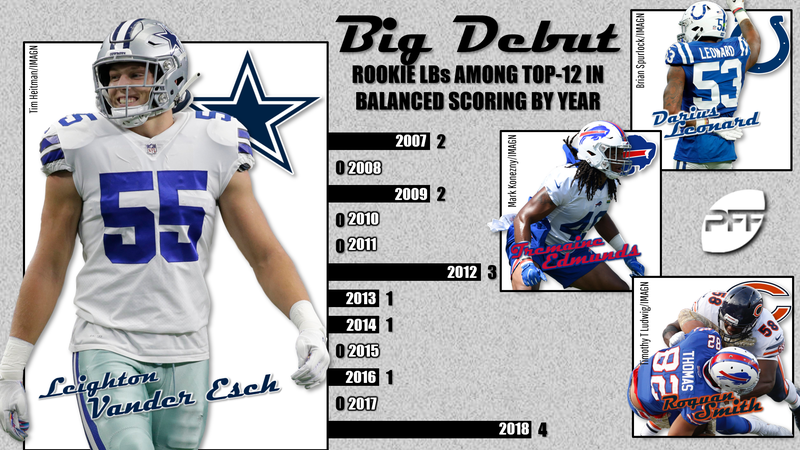 A slight increase in Vander Esch’s splash-play total along with the monster tackle totals he’s going to produce will be enough to vault him to the top of the linebackers scoring in 2019. Yes, I am planting my flag for Vander Esch to be not just the top linebacker next season but also the top-scoring overall IDP player. Bet on it. Well, if that’s your thing. Long live IDP.